The Lifesaving Society offers a variety of safety management training courses designed to enhance safety in aquatic facilities. These courses are hosted by the Society's Affiliate Members. Consult Find a Course or contact Michael Shane for more information. Courses may be run in any pool. The Society's Aquatic Safety Management programs do not require in-water sessions, although inspections of the aquatic facility and pool-water testing are an important part of these courses. Courses are delivered primarily through lecture format, and so a room with classroom set-up is recommended. 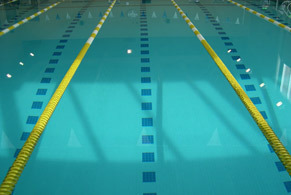 Pool Operator Levels 1 and 2: Access to a swimming pool deck and filter room during the course is required. No in-water sessions are required and deck work can take place while regular programming is occurring. Aquatic Safety Inspector and Safety Auditor: Access to a swimming pool deck, change rooms, office, equipment room, and filter room during the course is required. No in-water sessions are required and deck work can take place while regular programming is occurring. The amount of time necessary to ensure candidate success varies with a variety of factors including the number of participants, and the amount and type of previous training learners have received. The following estimates are based on the time required to teach a class of 15 learners. This is instructional time only; additional time must be allotted for breaks. Pool Operator Level 1 (8 hr. ): Programs are usually one day in duration. Typical hours are 9:00 a.m. to 5:00 p.m. Set-up time for the course is required prior to the course start time. Usually 2 hr. is sufficient time to allow for set-up. Pool Operator Level 2 (8 hr. ): Set-up time for the course is required prior to the course start time. Usually 2 hr. is sufficient time to allow for set-up. Aquatic Safety Inspector (10-12 hr. ): Programs are usually one-day and half-day in duration with the first day being the half-day and the second day the full day. Typical hours are: first day (1:00-5:00 p.m.), second day (9:00 a.m. to 4:00 p.m.). Set-up time for the course is required prior to the course start time. Usually 2 hr. is sufficient time to allow for set-up. Booking the lecture space overnight on the first day allows the room to remain set up for an early start on day 2. Aquatic Safety Auditor (4-6 hr. ): Set-up time for the course is required prior to the course start time. Usually 2 hr. is sufficient time to allow for set-up. SEE Auditor (3-4 hr. ): Set-up time for the course is required prior to the course start time. Usually 2 hr. is sufficient time to allow for set-up. *Replace with "safety inspection kits" for Aquatic Safety Inspector and Safety Auditor courses and with SEE evaluation forms for SEE Auditor courses. ** Booties are not required for SEE Auditor courses. The Lifesaving Society publishes a variety of resources designed for both candidates and instructors. These resources include master sheets for recording information such as candidate names and addresses, as well as course results. Master sheets should be forwarded to the Lifesaving Society when the course is complete for processing and the affiliate should retain a copy.